Home » What is Adwords? Google is the number 1 search engine in the World. That means more people by far are using Google to find what they are looking for than any other. If you want your website to be found by potential customers, you’d better have a strong presence on Google, or you might as well not have a site at all! Google Adwords is the service that lets you bid to get your website at the top of the results (Usually under ‘Sponsored results’ or similar) when certain ‘keywords’ of your choosing are searched for. As an example, a Car sales garage might want to attract people searching for ‘Cars for sale’, ‘Used cars’, or ‘Part exchange my car’. Google Adwords gives website owners the chance to leap-frog all the other listings to be the first result that people searching for those terms see. 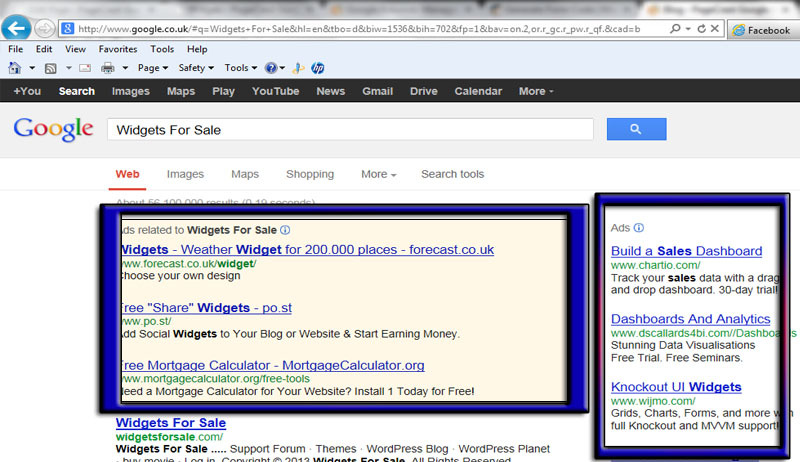 The ads in the blue boxes are examples of Adwords listings. Your company could be here within 24 hours! The methods for getting your site to the top of Page 1 of Google Search on the ‘organic’ listings, are constantly changing – that means that sites that were previously sitting pretty are now languishing far down the listings. Ask yourself, when was the last time you found what you were looking for on Page 2 or 3 of the search results? You have a far greater chance of getting visitors if your site appears on Page 1 of Google search results, and an even greater chance if your listing is at the top. The great thing about Google Adwords, is that you only pay when someone clicks on your advert (Pay-per-click). If it shows to a 1000 people, and only 1 clicks – you only pay for 1 click! And, depending on your budget, you can practically guarantee that your advert will be one of the very first that your potential customers see – before your competitors. It’s important to bear in mind that advertising with Adwords is reactive – you are only promoting your business to people who have shown an interest in what you have to offer. For a more breakdown of the terms used when using Google Adwords, take a look here. As of Spring 2011, Google had over 1.2 million businesses advertising on its search network.